This is a new server for a client. CDW changed their policy and they now charge a hefty sum to prebuild their servers so we are going to try it ourselves. The big box is the chasis while all the little boxes are the components--hard drives, processors, controllers, memory, etc. I get to open all the little boxes and put them in the big boxes. I'll trade ya. I'll put the server together, you can come and deal w/ pre-semester fun! 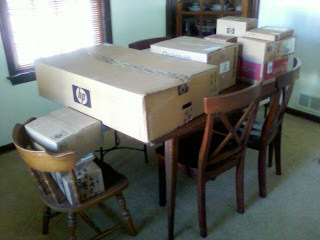 That's disappointing, assembling HP servers is one of the things I don't like about them. Definitely adds to the time it takes us to get stuff set up.